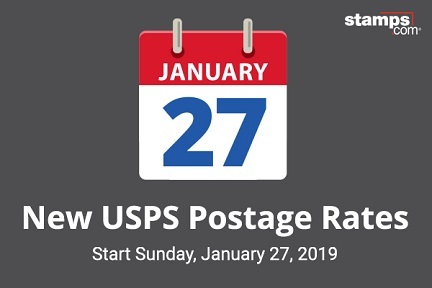 The USPS will implement new postage rates on Sunday, January 27, 2019, subject to approval by the Postal Regulatory Commission (PRC). First class "Forever" Stamps purchased before Jan. 27th will be usable after January 27th without adding the additional $.05. • The First Class Mail letter (1 oz.) rate for postage purchased at the Post Office is increasing by five cents to $0.55 from $0.50. • Each additional ounce for a First Class Mail letter will cost an extra $0.15 (a decrease from $0.21 in 2018). • First Class Mail Flats/Large Envelope rates are not increasing in 2019, remaining at $1.00 (1 oz. ), with additional ounces costing $0.15. • Postcard rates are also not increasing in 2019, remaining at $0.35. • Customers who print postage online (via Stamps.com), the Metered Mail rate will now be a 5 cent discount compared to the Post Office price with rates increasing to $0.50 in 2019 from $0.47 currently. • Each additional ounce will cost an extra $0.15 in 2019, a decrease from $0.21 currently. • The five cent discount for online postage on a one-ounce First Class Mail letter represents a savings of 9% for consumers and small business owners. International Letters – 1 oz. Priority Mail Express will see an average increase of 3.9%. Priority Mail Express Flat Rate Envelopes will also see a rate increase ranging from $0.70 to $0.72 depending on the envelope used. Priority Mail Medium Flat Rate Box is decreasing by five cents to $12.80 in 2019 from $12.85 currently. Priority Mail Priority Mail Large Flat Rate Box is decreasing by five cents to $17.60 in 2019 from $17.65 currently. Priority Mail Padded Flat Rate Envelope, a popular option for e-commerce sellers, is increasing by $0.45 to $7.55 in 2019 from $7.10 currently. Copyright © 2019 Boone Country Connection. All Rights Reserved.